Mix 1 scoop with 8-12 ounces of cold water 30 minutes prior to training, preferably on an empty stomach. To assess stimulant tolerance, start with one serving. Do not exceed 2 scoops in a 24 hour period. L-Tyrosine, Caffeine Anhydrous, Norcoclaurine, Theacrine (as TEACRINE™), Citrus Aurantium (fruit) (as AdvantraZ™). Yerba Mate Extract (leaf), Theobromine, Yohimbe hcl. It’s pretty simple. To help drive you in the gym there’s two factors that help ensure an intense workout. Stim & Pump. The stimulant aspect of Whiplash is very strong yet allows the user to achieve a great focus, strong stimulation, etc all without a crash. 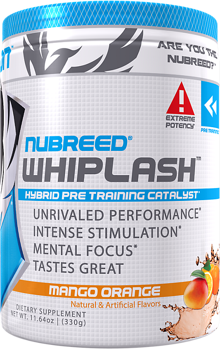 Unlike some pre-workouts which tend to deplete neurotransmitters which often leave this “crash” effect, you will not experience this with Whiplash.Now when it comes to pumps, some companies feel the need to use a lot of under-dosed ingredients to achieve this, or at least try to. We made it simple by adding in a whopping 1.25g of agmatine per serving.